A simple method to root I535VRUDNE1 Android 4.4.2 KitKat Firmware is now available at NasirTech. Samsung Galaxy S3 SCH-I535 (USA Verizon) recently get updated to the I535VRUDNE1 4.4.2 KitKat Firmware. If you yet to update the firmware, then update the same by following this link- I535VRUDNE1 Android 4.4.2 KitKat Firmware for Verizon Galaxy S3 SCH-I535- How to Install. Hope you updated this latest firmware on your device and now you can root the same using our simple tutorial below. The below guide will help you to root VRUDNE1 4.4.2 KitKat Firmware running on Galaxy S3 SCH-I535. Continue reading the tutorial for complete guide. So, want to root Galaxy S3 SCH-I535 Running I535VRUDNE1 4.4.2 KitKat Firmware? Continue reading this page to get all the necessary steps to successfully root your device. The root file (CF-Auto-Root) we used in this tutorial is safe and have nearly 100% success rate. We'll use Odin software to flash the root file. All the above pre-requisites are very important and must be followed before proceed to installation guide. Hope you get all the above points and done as mentioned. Now, you are ready to move to the final step of this tutorial where we have arranged a step by step details guide to root Galaxy S3 SCH-I535 running I535VRUDNE1 4.4.2 KitKat firmware. Congrats! 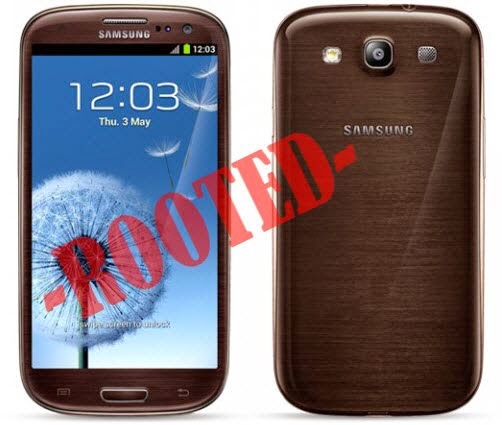 You have completed the tutorial to root Galaxy S3 I535 running I535VRUDNE1 4.4.2 KitKat Firmware. Hope you successfully done the rooting process. If you followed everything as mentioned in the above tutorial, then your Galaxy S3 I535 should now rooted and you have complete control over your device. Now, install apps that ask root permission or flash various custom ROMs. To verify your device is rooted or not, you can download and run the Root Checker App from Google Play Store. If you have any doubt or query about the tutorial, feel free to contact with us using the comment form below, and share your rooting experience with us. It was a great deal to visit this blog. It has so much of amazing content. I was very happy to see this content. i want to know what exactly is the benefit to root this variant of the Galaxy S3 because I have yet to find a way to install a custom recovery to flash any roms because they all require an unlocked bootloader. I hate Verizon and Samsung with so much of my being it's not even funny. I have 5 phones, and 4 of them are Samsung Verizon phones. Each is a piece of junk because of the bootloaders. I have never in my life seen such spite. They seek to be in control and have pretty much have been accused of possibly violating some legislation that prohibits this type of things according to some people but I have no idea how true it is. But I would tend to believe they get away with alot of things that are too technical for law makers to understand and inherently make judgemenet for or against so it continues to happen even on new devices. If the world was more educated to what Samsung and Verizon and even other carriers might be doing with their Samsung devices, I think we would all be buying Google variants or at least considering the LG variants that not only have built in developer modes with end user toggles for unlocking bootloaders, but they give us immediate ability to unlock phones to run on any other GSM carrier worldwide without having to deal with the carrier or manufacturer. Samsung and Verizon, and even AT&T on some models, have slapped people in the face and most people did not even realize it happened. Oh how some people might flip out if they actually knew what has been going on with the carriers and Samsung. It's just unreal it keeps happening. Someone please give me a ROM list for SCH-i535 variant running 4.4.2 with root. The bootloader is still locked. That is why I say, root access on this phone is just a worthless idea at this point. We are being forced to buy updated equipment unless we want to remain in the past but hey, when everyone finally figures out what is happening, they will gladly get new updated phones..... and switch carriers in the process since most offer killer free or discounted deals for switching. BY BY VERIZON and SAMSUNG!